The Mind Lock is a 3-dimensional sliding piece puzzle. It is closely related to such puzzles as Peter's Black Hole and the Varikon Box. This puzzle is essentially a 2×2×3 sliding cube puzzle which has been flattened along the third axis. It has a flat square frame with four square windows on both sides. Inside these windows are 11 tiles in three 2×2 layers with one gap. Tiles can move around by sliding into that gap. 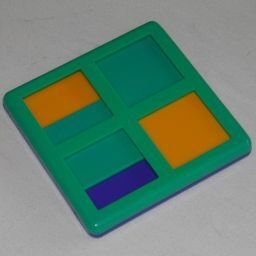 The main difference between this puzzle and the others is that it is not possible to slide tiles in the middle layer directly. You can only push them through to the front or back layers. There are 11 pieces, 4 green, 4 purple, and 3 yellow. For any particular position of the gap these 11 pieces can be arranged in 11! / (3!4!4!) = 11550 ways. There are 8 possible locations the gap could be, giving a total of 8·11550. However, the puzzle has no discernible orientation, and we can hold any of the four edges at the top. Therefore every position has been counted 4 times, and the real number of positions is only 8·11! / (3!·4!2·4) = 23100. There two solved positions, that differ only as to which side the gap is on. This shows that the puzzle takes at most 22 moves to solve (15.032 on average). There is essentially only one antipodal position, shown in the picture on the right. The table shows 4 antipodes, and this is because this position also occurs in mirror image, and/or colour-reversed (which in this case is the same as pushing the gap through to the other side). ThinkFun manufactured this puzzle back when they were still called Binary Arts. Hold the puzzle with the green side of the frame at the back. Do any moves to bring a green tile to the bottom left of the front face. Bring the gap to the rear face, to the bottom left and push the green tile through to the middle layer. Do any moves to bring a yellow tile to the bottom left of the front face, without disturbing the green tile in the middle layer. Bring the gap to the rear face, to the bottom left and push the yellow tile through to the middle layer, the green tile to the rear face. From now on these two tiles will not be moved again. Do any moves to bring a green tile to the bottom right of the front face, without disturbing the previously solved green and yellow tiles. Bring the gap to the rear face (without distubing the solved tiles), and to the bottom right. Then push the green tile through to the middle layer. Do any moves to bring a yellow tile to the bottom right of the front face, without disturbing the previous solved tiles. Bring the gap to the rear face, to the bottom right and push the yellow tile through to the middle layer, the green tile to the rear face. From now on these two tiles will also not be moved again. Without disturbing the four previously solved tiles, do any moves to bring a green tile to the bottom left of the front face. 1. Move the tiles in the top half until the green is at the top left, and the gap is at the top right. 2. Move up, right, down so that the green tiles both lie in the bottom half. Move the tiles in the top half until the last yellow tile is at the top left, and the gap is at the top right. 1. Move up, right, down, so that the yellow is at the bottom left, and a green at the top right. 2. Move forward, left, back, so that the green is pushed to the middle. 3. Move up, right, down, so that the yellow is at the bottom right, and the other green at the top right. 4. Move forward, left, back, so that the greens are pushed to the middle and rear. 5. Move up, right, down, so that the yellow is at the top right. 6. Move forward, left, back, so that the yellow is pushed to the middle. 7. Move right, to cover the yellow tile. Note that the same sequence of 6 moves is repeated until the puzzle is solved.